Wu Tsang and Fred Moten, We hold where study, 2017, two-channel HD video, color, sound, 18 minutes 56 seconds. 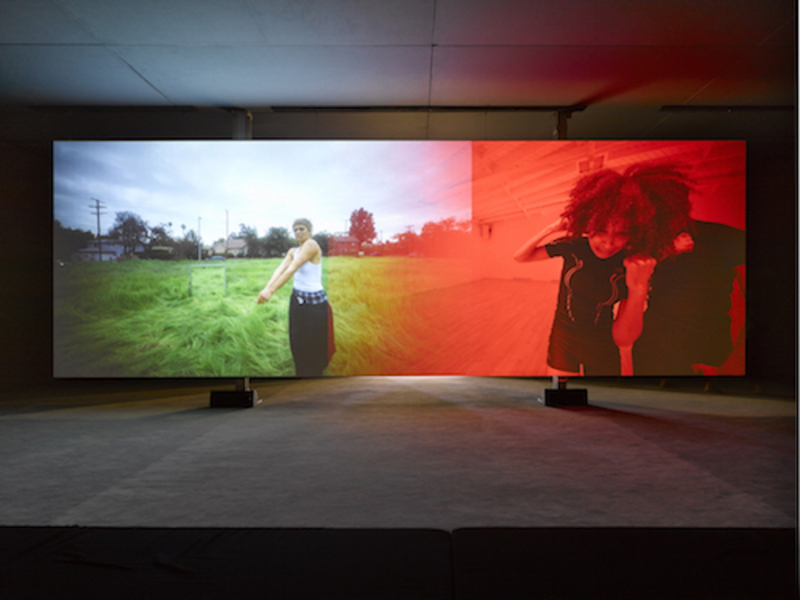 “How to create a situation in which study can feel like something—the tactile sense of something going on”: Wu Tsang and Fred Moten pose this question in Who Touched Me?, (2016) a publication that developed out of their residency at If I Can’t Dance, I Don’t Want To Be Part of Your Revolution, Amsterdam. No matter how obscure the phrasing might be, this query forms the basis of their ongoing artistic collaboration, including their joint works Gravitational Feel, 2016, and We hold where study, 2017, which both cast tactility as a mode of intellectual, artistic, and even poetic production. At Kunsthalle Münster, in front of Gravitational Feel’s shimmering column-like curtains of fabric knots in gold, navy, turquoise, and white, the two-channel We hold where study presents five chapters of “entanglements,” where two bodies on each side of the screen (except in the first chapter) engage in nonrepresentational yet emotive dance out in a field and in a studio. These chapters are menacingly titled after contemporary phenomena (often related to mass production and consumption), such as “The Assembly Line” and “The Algorithm.” In “The Consultant,” dancers appear to simulate ever-fluctuating financial indices rising and falling, and they do so with a curiously smooth chain of swift, staccato movements, which could well be mistaken for an unknown folkloric dance from the Caucasus. This flightiness yields itself to a palpable evocation of internal pressure in “The Socioecological Disaster”: On the left, two figures attempt to keep their heads touching as they simultaneously move together and push each other away—an involuntary haptic bond, a metaphor for our boundedness in fate.